The library I brought with me when I moved to Taipei in November. This and a kindle. A new year has arrived, and that means it is time to post my annual list of every book I have finished since the last new year's day. I have kept a list of every book I have read, along with a few short comments summarizing and casting judgment on each title, since 2010 (you can see my lists for 2013 and 2014 here and here). As in past years I have bolded and linked to the Amazon page of the ten best titles of the year. Only books that I read for the first time in 2015 qualify for inclusion in this category. As is often the case, my reading list is closely connected with what I have written for the Stage, and careful readers of the blog can probably piece together when I read many of these books by looking at the blog posts published throughout the year. 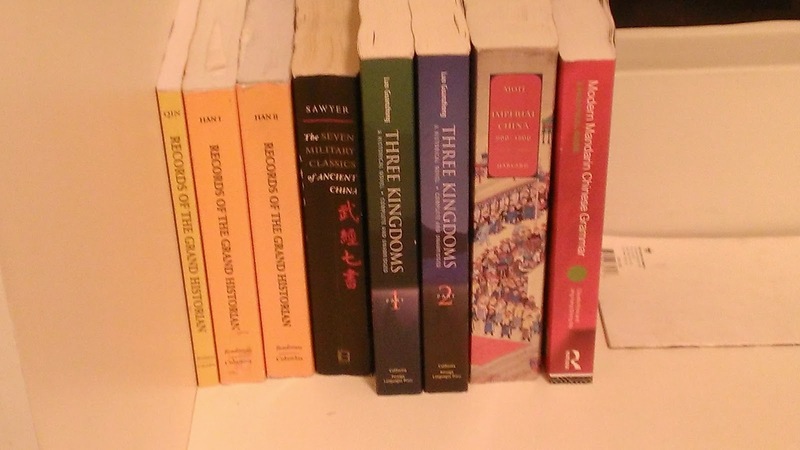 I will forgo the usual attempt to place a link to the individual posts related to the readings next to the book that inspired them, for several of these posts (especially "Darwin and War in Ancient China, Sengoku Japan, and Early Modern Europe," and "The Chinese Strategic Tradition: A Research Program") drew on a dozen or more of the books included here. It would be impractical to place a link next to every title. I began bolding my ten favorite books of the year with the hope that it would stop readers from asking me what the "best" book of the year was--when you are reading between 65-80 books a year choosing just one really is an impossible task. 2015 is different. This year has a clear winner. I found the story of this book I read so arresting that I read all five of its volumes twice. Had I copy with me here in Taiwan I would not hesitate to reread it all again. Never has a book jumped so fast to Quantum Library status. This book is Cao Xueqin's Dream of the Red Chamber, translated by David Hawkes and John Minford with its alternate title, The Story of the Stone. Dream of the Red Chamber is one of the "Four Great Classic Novels" of Chinese literature, and is almost universally described as the best of the four--and by extension, the best novel of Chinese history. I have been making my way through the classic novels through the last few years, but I gave priority to marshal epics like Three Kingdoms and Outlaws of the Marsh (Water Margin) over Dream, whose story centers around forlorn love and domestic squabbles. This was a mistake. Dream is just as good as the critics claim, and is in contention not just for the title of "best novel ever written in Chinese history," but "best novel written in human history." It is a book I shall treasure for the rest of my life. With that said, it is not a book for everyone. If you have no patience with the carefully constructed prose and clever ripostes of, say, a Jane Austen novel, then you might find Dream unfit for your tastes. Like Austen, Cao Xueqin is fascinated with the manners and mores of the aristocratic class, and he finds nothing more interesting than the inner lives of women. He is also just as discerning a wit. But where Austen's books all end on happy note, Cao Xueqin's story is one of bitter tragedy. One might call this tragedy Shakespearean in scope, but this is not quite right, for Cao Xueqin lets you into the head of his characters in a way that Shakespeare never did--tragedy as told by Dostoevsky or Conrad, with all of their psychological realism, is a better comparison. What is Shakespearean about Dream is its scope. There are hundreds of characters in this novel, ranging from fantastically rich aristocrats to their servants in the kitchen. Shakespeare was one of the few authors who could see the world through a dozen different social ranks and a hundred different ideologies. Cao Xueqin was another. I include all these references to Western authors to give you a sense for just how compelling Dream of the Red Chamber is. But Cao Xueqin was not a Westerner, and his book, written when the Qing Dynasty was at its height, is very much a part of the Chinese tradition. Cao Xueqin alludes to, quotes, and occasionally outright refutes poets, historians, philosophers, playwrights, and thinkers from across the 2,000 years of Chinese history that preceded him. His novel is in many ways the culmination of an entire civilization's heritage--the last great hurrah of Chinese thought before the West came in and broke it all down. You don't need to understand or catch all of these references to enjoy Dream, but a working knowledge of Daoism, Confucianism, and so forth will increase your appreciation for it's intellectual depth. However, it's prose (and here Minford and Hawkes' superb translation skills must be credited) will draw anyone in, regardless of their familiarity with traditional China. Indeed, Dream works as well as any book I know as an introduction to late imperial China, a society alien to modern Westerners and Chinese alike. Cao Xueqin paints a beautiful portrait of his time; if you want to understand what it felt like to live in the China at its zenith there is no better starting place than Dream of the Red Chamber. Well, that's enough of all that. As a primary source Dream of the Red Chamber is priceless, as an intellectual statement it captivating, and as a work of literature it is heart-rending. If all of this has not been enough to convince you to buy the book, nothing I could write ever will be. The other bolded books always have my strongest recommendation. Streich, Philip, “The Failure of Balance of Power in Warring States Japan, 1467-1590” (PhD diss., Rutgers, 2010). Strayer, Joseph, On the Medieval Origins of the Modern State (Princeton: Princeton University Press, 1999). Ferejohn, John and Frances Rosenbluth, War and State Building in Medieval Japan (Stanford: Stanford University Press, 2010). Tilly, Charles, Coercion, Capital, and European States, AD 900-1992 (Malden, MA: Blackwell Publishing, 1992). Hui, Victoria Tinbor, War and State Formation in Ancient China and Early Modern Europe (New York: Cambridge University Press, 2005). Conlan, Thomas Donald, State of War: The Violent Order of Fourteenth Century Japan (Ann Arbor: University of Michigan Press, 2003). Li Feng, Landscape and Power in Early China: The Crisis and Fall of the Western Zhou, 1045-771 BC (Cambridge: Cambridge University Press, 2006). Wu Cheng-En, Monkey: A Folk Novel of China, trans. Arthur Waley (New York: Grove Press, or. ed. 1941). Souyri, Pierre, The World Turned Upside Down: Medieval Japanese Society, trans. Kathe Rothe (New York: Columbia University Press, 2003). Cao Xueqin, The Story of the Stone, or The Dream of the Red Chamber, vol II: The Crab Flower Club, trans. David Hawkes (New York: Penguin Books, 1974). Duffy, Eamon, The Voices of Morebath: Reformation and Rebellion in an English Village (New Haven: Yale University Press, 1992). Lamers, Jeroen, Japonius Tyrannus: The Japanese Warlord Oda Nobunaga Reconsidered (Leiden: Hotei Publishing, 2000). Cao Xueqin, The Story of the Stone, or the Dream of the Red Chamber, vol III: The Warning Voice, trans David Hawkes (New York: Penguin Books, 1981). Chiang Chi Lu, “The Scale of War in the Warring States Period” (PhD Dissertation. Columbia University, 2005). Rogers, Clifford, eds. The Military Revolution Debate: Readings on the Military Transformation of Early Modern Europe (Boulder, CO; Westview Press, 1995). Mann, Charles, 1493: Uncovering the New World Columbus Created, rev. ed. (New York: Vintage Books, 2012). Cao Xueqin and Gao E, The Story of the Stone, or the Dream of the Red Chamber, vol IV: the Debt of Tears, trans. John Minford (New York: Penguin Books, 1982). Ertman, Thomas, Birth of the Leviathan: Building States and Regimes in Medieval and Early Modern Europe (Cambridge: Cambridge University Press, 1997). Cao Xueqin and Gao E, The Story of the Stone, or the Dream of the Red Chamber, vol V: The Dreamer Wakes (New York: Penguins Books, 1986). Schwartz, Stuart B, All Can Be Saved: Religious Tolerance in the Iberian Atlantic World (New Haven: Yale University Press, 2009). Hall, John. W., Nagahar Keiji, and Yamamura Kozo, eds. Japan Before Tokugawa: Political Consolidation and Economic Growth, 1500 to 1600 (Princeton: Princeton University Press, 1981). Schell, Orville, and John Delury, Wealth and Power: China's Long March to the 21st Century (New York: Random House, 2014). Addison, Joseph. Cato: A Tragedy and Selected Essays, ed. Christine Dunn Henderson and Mark E. Yellin (Indianapolis: Liberty Fund, 2004). Shakespeare, William. Othello. In Globe Illustrated Shakespeare: The Complete Works Annotated. ( New York: Greenwhich House Publishing, 1984). Krepenivich, Andrew. Maritime Competition in a Mature Precision Strike Regime. (Washington, DC: Center for Strategic and Budgetary Assessment, 2015). Wang Wensheng, White Lotus Rebels and South China Pirates: Crisis and Reform in the Qing Empire (Cambridge, Ma: Harvard University Press, 2014). Cao Xueqin, The Story of the Stone, or The Dream of the Red Chamber, vol I: The Golden Days, trans. David Hawkes (New York: Penguin Books, 1974) . Tacitus. Annals. in Complete Works of Tacitus,.Moses Hadas, ed. and introduction, Alfred John Church and William Jackson Brodribb, trans. (New York: Random House, 1942), 3-339. Tacitus. Life of Cnaeus Julius Agricoloa. in Complete Works of Tacitus, Moses Hadas, ed. and introduction, Alfred John Church and William Jackson Brodribb, trans. (New York: Random House, 1942), 677-709. Tacitus. Germania. in Complete Works of Tacitus,.Moses Hadas, ed. and introduction, Alfred John Church and William Jackson Brodribb, trans. (New York: Random House, 1942), 709-735. Stockman, Daniela, Media Commercialization and Authoritarian Rule in China (Cambridge: Cambridge University Press, 2013). Heather, Peter. The Fall of Rome: A New History of Rome and the Barbarians (Oxford: Oxford University Press, 2007). Mattern, Susan. Rome and the Enemy: Imperial Strategy in the Principate. (Berkeley: University of California Press, 1999). Rowling, J.K. Harry Potter and the Sorcerer's Stone. (New York: Scholastic Books, 1998). Rowling, J.K. Harry Potter and the Chamber of Secrets (New York: Scholastic Books, 1999). Rowling, J.K. Harry Potter and the Prisoner of Askaban (New York: Scholastic Books, 1999). Ward Perkins, Bryan, The Fall of Rome and the End of Civilization (Oxford: Oxford University Press, 2006). Rowling, J.K. Harry Potter and the Goblet of Fire. (New York: Scholastic Books, 2000). Rowling, J.K. Harry Potter and the Order of the Phoenix (New York Scholastic Books, 2003). Rowling, J.K. Harry Potter and the Half Blood Prince (New York Scholastic Books, 2005). .
Rowling, J.K. Harry Potter and the Deathly Hallows (New York Scholastic Books, 2007). Luttwak, Edward, Strategy: The Logic of War and Peace (Cambridge: Belknap Press, 1987). Burns, Thomas, Rome and the Barbarians: 100 BC-AD 400 (Baltimore: John Hopkins University Press, 2003). Hawkes (New York: Penguin Books, 1981). Schwartz, Benjamin, The World of Thought in Ancient China (Cambridge, MA: Belknap Press, 1985). Macmullen, Ramsay. Corruption and the Decline of Rome (New Haven: Yale University Press, 1988). Shakespeare, William. Twelfth Night. In Globe Illustrated Shakespeare: The Complete Works Annotated. (New York: Greenwhich House Publishing, 1984). Shakespeare, William. Much Ado About Nothing. In Globe Illustrated Shakespeare: The Complete Works Annotated. (New York: Greenwhich House Publishing, 1984). Pye, Lucian. The Mandarin and the Cadre: China's Political Cultures. (Ann Arbor: University of Michigan Press, 1988). Hamilton, Sue. Indian Philosophy: A Very Short Introduction. (Oxford: Oxford University Press, 2001). Tagore, Rabindranath. Home and the World. Translated by Surendranath Tagore. (London: Macmillan, 1915). Blackman, Caroline. Negotiating China: Case Studies and Strategies (Crows Nest, Australia: 1997). Mill, J.S. On Liberty. (New York: Walter Scott and Publishing Co, 1903, or. ed. 1859). Achebe, Chinhua. Arrow of God (New York: Anchor Books, 1969). Mintzberg, Henry; Bruce Alhlstrand, and Joseph Lampell. Strategy Safari: A Guided Tour Through the Wilds of Strategic Management (New York: Free Press, 1998). Sun Bin, attr. Sun Bin’s Art of Warfare: A Translation of the Chinese Classic of Philosophy and Strategy, trans. D.C. Lau and Roger T. Ames (Albany: SUNY Press, 2003). Hand, David. Statistics: A Very Short Introduction. (Oxford: Oxford University Press, 2008). Radhakrishnan, Sarvepali and Charles Moore. A Sourcebook in Indian Philosophy (Princeton: Princeton University Press, 1957). Tolkien, J.R.R. The Lord of the Rings, 50th anniversary ed. (New York: Houghton Mifflin Harcourt, 2004). Du Bois, Souls of Black Folk, e-book ed. (Gutenberg, 2008). Moore, David S. The Basic Practice of Statistics. (New York: W.H. Freeman and Company, 2010). Harmsen, Peter. Shanghai 1937: Stalingrad on the Yangtze (Philadelphia: Casemate, 2013). Mitter, Rana. Forgotten Ally: China's World War II, 1937-1945 (New York: Houghton Mifflin Harcourt, 2013). I also read substantial portions of, but did not finish (or am still reading), The Rise of Fiscal States: A Global History; The Rise of Fiscal States in Europe, 1200-1815; War in Human Civilization; The Military Revolution; Cambridge History of Japan, Vol 3: Medieval Japan; Cambridge History of Ancient China; Evolutionary Biology; What It Takes to Win: Succeeding in 21st Century Battle Network Conditions; Records of the Grand Historian, Deciphering Sun-tzu; Sharpening the Spear: The Carrier, the Joint Force, and High End Conflict; the Edward Slingerand, Roger Ames, and James Legge translations of the Analects; The Mahabharata: A Modern Retelling; and The Rising Sun: Decline and Fall of the Japanese Empire. Fig. 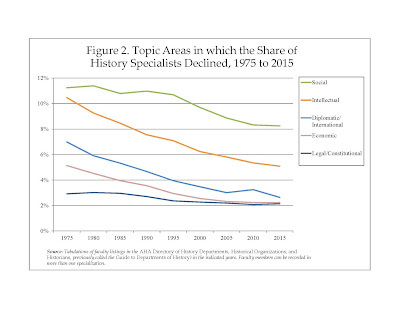 1 and 2 from Robert Townsend, "The Rise and Decline of History Specializations over the Last 40 Years,"
Perspectives on History (December 2015). Military historians survived this upheaval by weaving their narratives out of a new sort of warp and weft. Most importantly, historians began to tell the story of warfare from perspectives rarely explored in earlier eras. This is where the "War and Society" version of military history started, as historians sought to highlight voices missing from the old bugle-and-battles narratives. Some of these new histories told stories that would not traditionally have been considered military history at all–how a war was experienced by its widows, for example, or how the imagery or poetry and art of a society at war changed as death tolls mounted. But more traditional campaign narratives also began to change. Traditionally, these narratives often took the perspective of commanders and generals; the battle maps marked with x's and arrows you find in U.S. Civil War atlases are products of this sort of thinking. In the '70s and '80s this focus began to shift. John Keegan's Face of Battle and Paul Kennedy's Rise and Fall of Great Powers are two landmark examples of the discipline's new priorities. Keegan's book posed questions like, "what compelled soldiers on the front line to fight in different eras of history?" and "what did it feel like to be a grunt at Agincourt, Waterloo, or the Somme?" While he was not the first to attempt these questions, he was one of the best prose writers to do so, and his book caught the attention of professional historians and laymen alike. As such Face of Battle was one of the most important works of military history written during the 20th century; after it was published no historian could get away with writing a narrative history of any war without describing what it looked like on the ground. If Keegan telescoped in on the individual soldier, Kennedy's Rise and Fall expanded the narrative out until it included the workings of entire nations and economies. Kennedy suggested that success in battle had much less to do with operational art or strategic savvy than economic growth and industrial policy. For him victory in war was decided first and foremost by macroeconomics. Kennedy's presentation thus inverted the concerns of the War and Society researchers. Where they focused on how waging war changed a nation's social life, Kennedy asked how a country's social life changed the way it waged war. A number of works in a field that would be later called "world history" anticipated Kennedy's quest to tie the history of military conquest to globe-spanning macrohistorical trends, but only a few of these were ever received with the enthusiasm that showered Kennedy's Rise and Fall. That has changed. Today one or two books of this type are published every month. The popularity of Kennedy and Keegan's books with "general readers" suggests that there was more to military history's new direction than the whims of academic fashion. There was real demand for works that presented warfare and strategy from new perspectives. While a few historians--here John Lynn comes to mind--have tried to revive the more traditional sorts of narrative campaign histories, most felt that this new style of military history was a necessary corrective to what came before. The story of generals and statesmen had been told many times over the centuries; the stories of the soldiers, and of the societies transformed by soldiering, had yet to be told. For the past three decades Western military historians have busied themselves telling these stories. This brings us to my second point. Contemporary historians of East Asia have the same basic set of priorities as the rest of their profession. They focus on structures, cultures, identities, and the hidden voices of history. This is unfortunate, for the historiography of East Asia--especially premodern East Asia--did not follow the same path of development as the historiography of Europe and North America did. The flight from narrative campaign histories was an understandable reaction to high politic's dominance in the literature. However, in the study of East Asian history, narrative political, diplomatic, and military histories never dominated to begin with. The idea that East Asianists need to counter the biases of existing, politics-heavy narratives is mistaken, for in too many cases there are no existing narratives to counter in the first place. We are left with huge gaps in the literature. In the case of military history, there are entire wars where millions of people fought and died, and whose stories are instantly recognized by people across China, Japan, and Korea today, that still have no books written about them in English. Part of the problem is size. The number of East Asianists in academia is small. The number working on pre-modern East Asian history is pitifully small. You can count the number of American scholars who specialize in Silla Korea on one hand. You could count those who specialize in Sengoku Japan on two. You could fit all the specialists on the Northern Song Dynasty on a moderately sized tour bus. 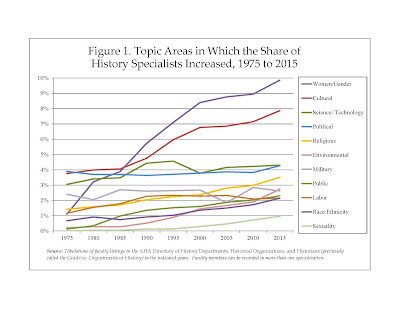 This is true now; back when narrative political and military histories was more academically fashionable (c. 1920-1960) the number of East Asianists were even smaller. Because only a few scholars specialized in East Asia then, the peculiar research interests of one scholar and his pupils forty years ago have come to dominate entire fields today (one example of this is the substantial amount of work done on medieval Japan's institutional history, something I credit entirely to the influence of John Whitney Hall, who taught Japanese history at Yale for the better part of the last century). There simply weren't enough historians writing then to fill in the gaps. In addition, many of those who wrote then were relatively unconcerned with high politics, diplomacy, or military affairs. They came to the study of traditional Asia with a set of non-traditional backgrounds. Then—as now—a great deal of East Asian history is written by philosophers, philologists, and archaeologists. These are men and women who began to study East Asia because of a fascination with Pure Land Buddhism, Neoconfucian metaphysics, Shang Dynasty bronzes, or reconstructing classical Chinese pronunciation. In most areas linguistics, philosophy, literature, and religious studies are separate fields, but in the case of the East Asianists (and here a fruitful analogy with the Classicists can be made) they blur somewhat. The very term "East Asianist" (along with its subsets: "Sinologist,""Koreanist," etc.) express the expectation that those studying one aspect of pre-modern Asia should be conversant in all of its other domains. In this milieu intellectual history has always been king. This is partially because many of these disciplines began as an attempt to make the "Eastern mind" accessible to Westerners, and it is partially because it is incredibly difficult to understand even fairly mundane historical sources without a working knowledge of classical Chinese and the history of ideas in East Asia. The interdisciplinary nature of this sort of intellectual history sheltered it somewhat from the political storms and of the '60s and '70s. It is still the strongest strain of historical scholarship on the region. The downstream effects of all this are pretty easy to see. By far the most common textbook for introductory survey courses of East Asian history is Sources of the East Asian Tradition, a collection of mostly philosophical and literary documents from the last few thousand years of East Asian history. The Association for Asian Studies annual conference rarely has panels on the political or military history of Sengoku Japan, but there will always be room for one more panel on the Tale of Genji to be squeezed in. Most important of all, however, is a limited sense of audience on the part of the East Asianists. I hammered this point home in my "Chinese Strategic Tradition: A Research Program" essays, so I'll be a bit briefer here. In essence, East Asianists are prone to write for each other. Only each other. This is partly because a lot of the legwork of East Asian history involves debating esoteric items like the details of a calendar system no one has used for a thousand years or reconstructing the pronunciation of 9th century Vietnamese and 17th century Manchu. It is also because popular interest in East Asia is really quite a new thing. But it is a thing. This is something few East Asianists realize. About a year ago I had an experience that brought this lack of vision to my attention in a rather forceful way. I was exchanging messages with a grad student who was then in the beginning stages of a dissertation on the early Song dynasty. I asked him if he would ever be interested in writing a narrative account of the political and military events that occurred during the period in question. He asked in response: "Why would I ever want to do that? That would just be rehashing the Zizhi Tongjian. What would be the point?" This is an extraordinary statement. The Zizhi Tongjian is a 20 volume history written in the 1070s AD. It is regarded as one of the greatest historical works of East Asia. It also has not been translated into English! You could fit all of the Westerners fluent enough in classical Chinese to read the Tongjian in a small auditorium. Sharing the information contained inside the Tongjian with the millions who don't read classical Chinese would be a worthy deed. There are scholars who study political science, strategic studies, and world history who would be eager to read a narrative account of the period. If it was written well enough it might catch the interests of thousands of 'educated readers' outside the academy altogether. But it is not to be! The only audience that mattered to my interlocutor was the one who could read the Tongjian already. Wang Wensheng made a similar critique in his book on the White Lotus Rebellion: "Most historians and social scientists tend to focus more on the explanatory power of structures while remaining less informed about the significance of events." 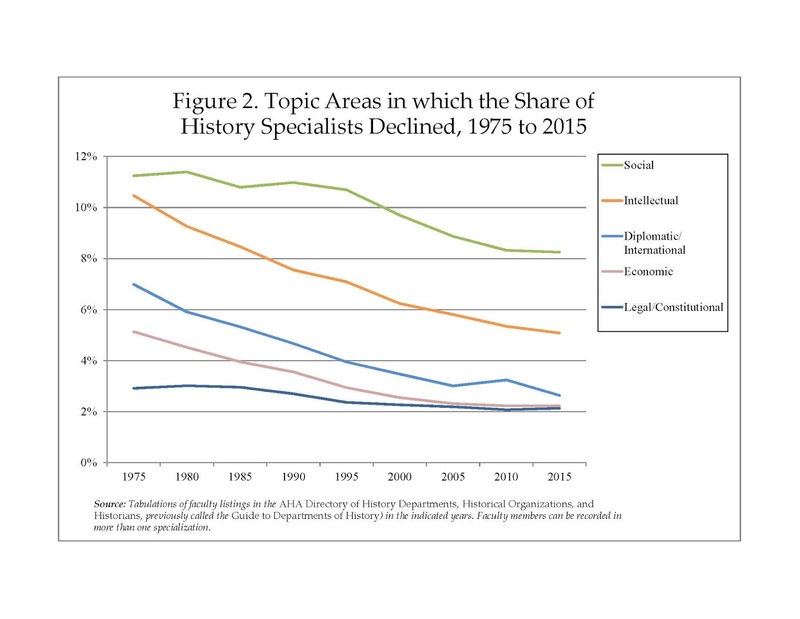 Wang sees this as problem ailing all historians, but it is clear to me that it afflicts some sub-disciplines more than others. Were you to pick up the five or so most cited books on Europe during the Thirty Years War or England and France during the Hundred Years War you would leave with a firm chronology of the main events of each. But in East Asian historiography there are some eras—for example, Sengoku Japan—which an extensive amount has been written about, but which still fail to provide the reader with any narrative account of what actually happened. In the case of Sengoku Japan, there are (thanks to John Hall's students) a great number of studies on the institutional history of late Medieval Japan. Many scholars have investigated how the relentless warfare of that era shaped the country's political and religious institutions, transformed its culture and arts, and altered its social structure. You can learn without much difficulty how Sengoku Daimyo funded their conquests, fed their troops, managed their inheritance, dealt with the Buddhist monastics and Christian missionaries roaming the country, distributed booty, passed laws, negotiated with the court, regulated industry and farming, selected generals, and thought about political and military authority in general. But if you want to discover the story of individual Daimyo or individual Daimyo domains, then there is little you can find in a book store to help you. Historians of Japan write with the assumption that the reader of his or her works is already familiar with the major events and players of the time period—and for the most part they are right, for no one but other specialists in Medieval Japan can read that sort of scholarship. There is something of a self fulfilling prophecy at play here. I don't expect it to end any time soon. There is a strong demand for histories of East Asia's many wars. This demand is unmet. Until East Asianists deem readable narrative accounts as more than redundancies unworthy of their time, this will always be the case. -A more formal and in depth review essay on Chinese military history and strategic theory. "Darwin and War in Ancient China, Sengoku Japan, and Early Modern Europe"
-Why I read all those institutional histories of Sengoku Japan in the first place. "The Road to Beijing Runs Through Tokyo"
-In which I argue that a cadre of Japan experts is a more critical national security need than a cadre of China hands. My analysis is limited here to Anglophone scholars. When I say "East Asianist," "historians of East Asia," "historians of Japan," and so forth, I mean historians of East Asia from the West, and especially those writing in English. The historiography of warfare in various East Asian countries is a fascinating topic, but one better left for its own post(s). This attitude is not simply a relic of the '60s. See Adam Elkus's recent (9 Dec) post on those who attack scholars studying terrorism for producing 'actionable' insights. Also, the numbers in the graphs can be a bit deceptive. 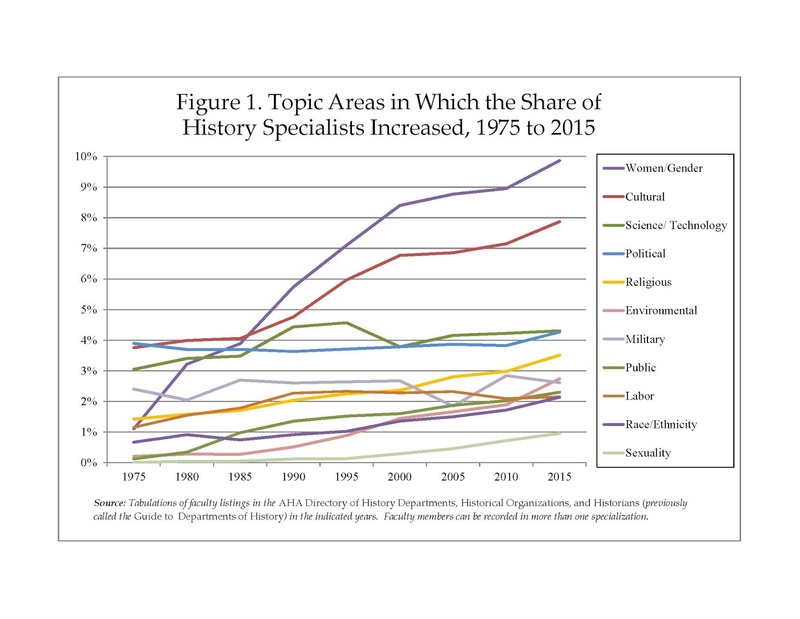 See John Lynn's article in note 3 for an explanation of why military history is in rather dire straights at the institutional level. John Lynn, "Breaching the Walls of Academe: The Purposes, Problems, and Prospects of Military History," Academic Questions 28, iss 1 (2008), pp. 18-36; “The Embattled Future of Academic Military History,” Journal of Military History 61, no. 4 (October 1997), pp. 777-89. An exchange I had about Muromachi era with one professor is a fairly typical example. He told me how much he loved Pieree Souryis' The World Turned Upside Down: Medieval Japanese Society (Asia Perspectives: History, Society, and Culture) because it focused so much on the organizational efforts of peasants and Buddhist orders instead of just focusing on the samurai. "The problem with a lot of Japanese history is that historians are to apt to sympathize with the Samurai and tell the story from their perspective. Books like this show something different." I concede that Souryi's book is fascinating, and probably the single best introduction to medieval Japan to boot. However, his notion that the majority of books are written from the perspective of the Samurai is absolutely false, especially if it is the Muromachi era up for discussion. This may be true in Japanese, but it is not true in English. Daimyo like Takeda Shingen and Uesugi Kenshin, who are household names in Japan, have no biographies in English. You will be hard pressed to find any book that tells their story even in a cursory fashion. And these are two of the most famous men in Japanese history! Were one to tally all the books published about Muromachi/Sengoku Japan up I suspect that you would find more about the beliefs, practices, and organization of Japan's monastic orders (or the culturally elite but politically marginal aristocrats in Kyoto) than you would about the Daimyo. This is true for Western historical sources as well, of course, but it is less apparent to us because we are taught the basic ideas and references from a young age. Wang Wensheng, White Lotus Rebels and South China Pirates: Crisis and Reform in the Qing Empire (Cambridge: Harvard University Press, 2014), p. 10.